When the US military responded to the threat of roadside bombs (IEDs), the tactical vehicle manufacturers developed the family of V-shaped hull Mine-Resistant Ambush Vehicles (MRAPs). The rapid insertion of the MRAP vehicles into the Army’s inventory has been credited with saving many lives over a period of years. Each armored door on the MRAP weighs over 1,000 lb and is virtually impossible to open or close quickly during combat operations. Over 27,000 MRAP vehicles have been produced, many of which use the patented Door Assist System from Control Solutions LLC. 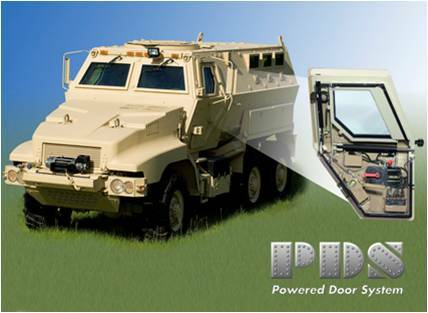 The Powered Door System (PDS) provides a complete turnkey solution for safely and quickly opening and closing the heavy armored doors on the MRAP vehicles. The PDS from Control Solutions LLC has the ability to open the heaviest of vehicle doors on steep uphill or downhill slopes. The PDS is the only electro-hydraulic system that can open the door even when the vehicle is on its side. The feature-rich door assist system provides the vehicle crew with the ability to operate the doors even when the truck power system is inoperable, limits ingress by unwanted personnel, provides emergency egress, and features programmable stop locations, intelligent battery charging, fail-safe activation, and a host of other provisions that enhance the operation, efficiency, and safety of the passengers. It’s not just a slogan, it’s what we do! Control Solutions LLC is your one-stop integrator for tough motion control problems. Our team of engineers and ISO-certified manufacturing facility stands ready to quickly design and manufacture an innovative solution for your application..